Chris Barton on Chris Barton: “Of all the cities where I could have stumbled into the world of children’s literature, I couldn’t have done it in a better place than Austin, Texas. “A native Texan who gravitated to Austin for college and have been here most of the time ever since, I’m surrounded by a freakishly talented local bunch of children’s authors and illustrators. I’m glad they’ve let me hang around. “I alternate between writing fiction and nonfiction — when doing the former, I often long for the certainty and structure that come with established fact, and when doing the latter, I sometimes wish for the freedom to just make stuff up. What led you to write for young readers? Fire safety. When my older son was a toddler, I installed a smoke detector, and he asked me to tell him over and over the story of how I’d done that, complete with drill sounds and alarm sounds. One day, it hit me that if I could make him happy with that story, there were probably other stories I could tell, and more kids that I could share them with. Up until then, I’d spent several years adrift as a writer, not knowing what I wanted to write or for which audience or in which medium. That smoke detector was a great investment. I started writing stories for children around the end of 2000 and almost immediately began shopping these lousy manuscripts to agents. Obviously, I was impatient, but I’ve learned a whole lot about patience in the years since. Real life has intervened along the way in ways both positive and negative, both for me and for some of the people I’ve worked with–births, deaths, moves, layoffs. Some of the more significant milestones have been joining the Austin chapter of SCBWI in 2001, selling The Day-Glo Brothers in 2004, starting my blog [Bartography] and signing with my agent in 2005, selling three books in the spring of 2007, and enjoying what’s happening right now–at long last–with the publication of my first book. Looking back on your apprenticeship, what was most helpful to you in developing your craft? Just showing up. Showing up at my desk most days at 5 a.m. to write or do writing-related work, and spending most of my lunch hours the same way, and often my evenings, too. Showing up for critique group meetings, whether in person or online, so that my writing can benefit directly from what my partners have to say and indirectly from what I learn by considering their work. Showing up for conferences and workshops, in equal parts for what I learn about writing and publishing and for the camaraderie with the friends I make and catch up with there. And showing up at the library to swap out another stack of books. 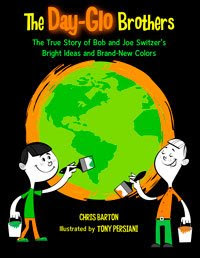 Congratulations on the publication of your debut book, The Day-Glo Brothers: The True Story of Bob and Joe Switzer’s Bright Ideas and Brand-New Colors, illustrated by Tony Persiani (Charlesbridge, 2009)! Could you tell us about it? Well, you know those fluorescent oranges and yellows and greens that you see every day on traffic cones, safety vests, highlighters, and so on? Until about 70 years ago, those colors didn’t even exist. The Day-Glo Brothers is the story of the guys who invented those colors while they were in their teens and 20s back during the Depression and World War II. In August 1997, I saw The New York Times obituary for “Robert Switzer, Co-Inventor Of Day-Glo Paint.” Up until that moment, I had never wondered where those fluorescent oranges, yellows, and greens came from, even though I had seen them my entire life. It hadn’t occurred to me that those colors had been invented or that there had been a time when they didn’t exist or that there was a particular name for the glow they give off: daylight fluorescence. But once I read that obituary, I couldn’t stop thinking about Day-Glo colors and their origins and the brothers who created them. The Switzers’ story stuck with me. And it’s a good thing that it did, because at that time, I wasn’t thinking about writing their story or any other story for young readers. It occurred to me in the spring of 2001 that a picture book about the invention of Day-Glo colors, using those actual colors in the art, could be really, really cool. So, I got in touch with members of the Switzer family and began my research, and that fall, I began shopping a ridiculously long version of the manuscript around to publishing houses. Robbie Mayes, then an editor at Farrar Straus & Giroux, helpfully suggested that it would be tough sledding for a 6,000-plus-word picture book, but even after I cut the length by about two-thirds, even after 23 submissions, I still couldn’t find an editor who saw what I saw in this story. Austin librarian extraordinaire Jeanette Larson could see it, though, and she put me in touch with Charlesbridge editor Yolanda Leroy (editor interview) in early 2004. Yolanda got it immediately. Charlesbridge bought the book that year. And the single best thing that happened was art director Susan Sherman getting Tony Persiani to illustrate the book. Tony’s style is perfect for the period when the story takes place, and for humorously balancing out a text that includes phrases like “uranine or anthracene,” and for allowing the spot placement of those Day-Glo colors that do indeed look really, really cool. There were four big ones. First, Bob and Joe Switzer were true collaborators, but Bob lived a long life and recorded a lot of his recollections of their work while Joe died relatively young without documenting his contributions in a way that would have been helpful to folks like me. So, one challenge was making sure that the story I told didn’t reflect that imbalance in the source material. My interviews with Joe’s first wife and with Bob and Joe’s younger brother helped me get a clear sense of who Joe was and what he had brought to the partnership. Another problem was that I liked Bob and Joe so much and found them so fascinating that I wanted to include everything about them–that’s how a picture book gets to be 6,200 words long. It took some doing to narrow my focus down to just the fascinating parts of their story that relate most directly to their development of Day-Glo colors. Then there was the science–I had managed to stop the narrative cold, not once but twice, with explanations of how regular fluorescence and daylight fluorescence work. Yolanda and I whittled the main text down to what was absolutely essential and moved the more detailed explanations to the back of the book, and Charlesbridge put together a terrific online animation to reinforce that. Finally, there was the use of color itself. In four-color printing, if your three non-black colors are daylight fluorescent orange, yellow and green, and those colors weren’t invented until the latter part of the story, what do you show in the pages that come before? The folks at Charlesbridge came up with a fantastic solution–start the story in black and white, and then start using those Day-Glo colors sparingly and at partial strength, and increase their strength and presence as the story moves toward its climax. What about children’s nonfiction appeals to you? The wide-openness of possible subjects. There’s an endless supply of topics begging to be explored, and an audience that’s intensely curious about specific parts of the real world that adults may take for granted. I also like the challenge of distilling a subject down to what fits into a 32- or 48-page book–it’s not a matter of just limiting the word count, but of framing a story in a way that makes sense, of both giving a sense of a complete take on a subject while sparking a reader’s interest in seeking out more knowledge about it. What advice do you have for those interested in writing a picture book biography? Look at the things that you’re already unusually interested in and ask yourself, who was a pioneer in that realm? Who was the best it? Who had a unique approach to it? That’s a person that you’re already in a great position to write about. What is it like, being a debut author in 2009? It’s satisfying. I’m sure it would have been satisfying for me to have debuted in 2005, or in 2007, but having waited and persevered for so long does make this whole experience a little sweeter, I think. And it’s given me time to accumulate more friends and supporters in the world of children’s books–editors, bloggers, librarians, other authors, parents of young readers–who are sharing in the excitement with me, and that’s making for a fun time. Be patient. Before you send a manuscript out there to make an impression on your behalf, take all the time you need to get it into great shape. And then cut it some more. I’ve got two sons, ages 10 and 5, a wife who, among other things, is very active in Austin’s impressive belly-dancing community, and five hens in my back yard–all of whom I enjoy spending time with. I’m good for occasionally making a massive batch of chili or red beans and rice or Hopkins County Stew. And ever since my younger son expressed his concern a few years ago that “all the musicians are dying” because of my fondness for performers who had long since unplugged from this mortal coil, I’ve been making a concerted effort to expand my musical tastes and keep current with recordings being made today by artists who are, in fact, not dead. As a reader, so far what is your favorite children’s/YA book of the year and why? Instead of a favorite individual book, how about my favorite cumulative output by one particular writer? 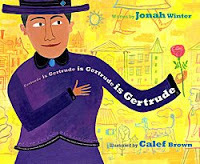 Already this year, Jonah Winter has published picture book biographies of Sandy Koufax, Gertrude Stein, and Gilbert & Sullivan. What was that I was saying about the wide-openness of possible subjects? My second book, the thoroughly un-non-fiction Shark Vs. Train, will be coming out from Little, Brown next April. 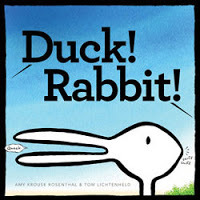 My illustrator for that is Tom Lichtenheld (Duck! Rabbit! (Chronicle, 2009)), and Tom and I had so much fun collaborating on Shark Vs. Train that I almost hated to see that process come to an end. Almost. Anyway, just as many readers have wondered (I hope) what makes Day-Glo work, I’m sure that many others have wondered who would win in a competition between a shark and a train, and I’m glad that Tom and I have been able to shed some light on that. Don’t miss the Charlesbridge supplemental online animation about Day-Glo! See also an interior illustration of the book. Enter to win one of five author-signed copies of The Day-Glo Brothers: The True Story of Bob and Joe Switzer’s Bright Ideas and Brand-New Colors, illustrated by Tony Persiani (Charlesbridge, 2009)! Three copies are reserved for teachers, librarians, and university professors of education, library science, and/or youth literature! (Please indicate title and affiliation). Two copies are reserved for any Cynsations readers! To enter, email me (scroll and click envelope) with your name and snail/street mail address and type “Day-Glo Brothers” in the subject line. Deadline: July 31! 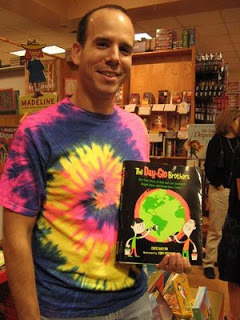 Attention Central Texans: join Chris for his launch party at 1 p.m. July 11 at BookPeople in Austin!